** The cake must have some cocoa, but not too much because it is not a chocolate cake. 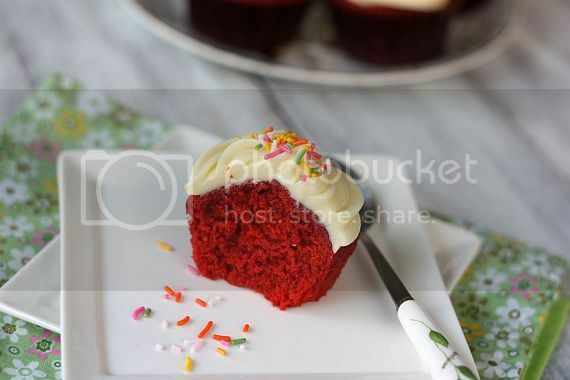 ** The cake must have red food coloring; beet juice does not add the right kind of red. ** The cake must have cream cheese frosting. ** You must use a hand-held electric mixer, not a stand mixer: Larger machines can over-mix the batter, which sometimes prevents the cake from rising properly. Recipe adapted from "Joy of Baking"
2) In a large bowl sift together the flour, baking powder, salt, and cocoa powder. 3) In the bowl of your electric mixer, or with a hand mixer, beat the butter until soft (about 1-2 minutes). Add the sugar and beat until light and fluffy (about 2-3 minutes). Add the egg and beat until incorporated. Scrape down the sides of the bowl. Add the vanilla extract and beat until combined. 4) In a measuring cup whisk the buttermilk with the red food coloring. With the mixer on low speed, alternately add the flour mixture and buttermilk to the butter mixture, in three additions, beginning and ending with the flour. 5) In a small cup combine the vinegar and baking soda. Allow the mixture to fizz and then quickly fold into the cake batter. 6) Working quickly, divide the batter evenly among the 12 muffin cups and smooth the tops with an offset spatula or the back of a spoon. Bake in the preheated oven for approximately 18 - 23 minutes, or until a toothpick inserted in the center of the cupcakes comes out clean. 7) Cool the cakes in their pans on a wire rack for 10 minutes and them remove from pan. Let cool completely before frosting. Either spread the frosting with a knife or offset spatula, or use a large 1M Wilton open star decorating tip to pipe the frosting. Place cream cheese in a medium mixing bowl. Using a rubber spatula, soften cream cheese. Gradually add butter, and continue beating until smooth and well blended. Gradually add in the icing sugar and continue beating until smooth. Finally add in the lemon juice and beat to combine. 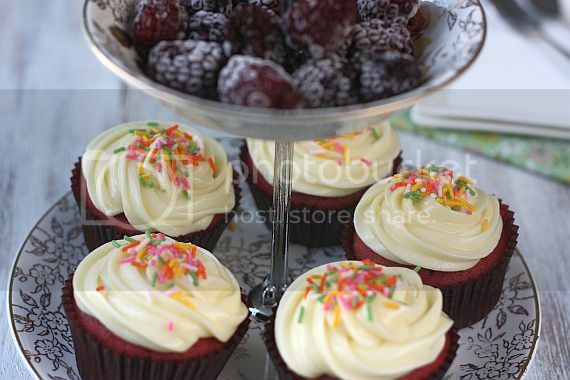 If icing is too soft to pipe, place in refrigerator for about 20 mins. One word, Beautiful! 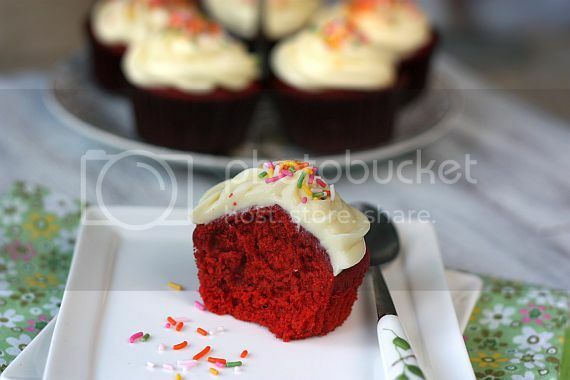 Lovely looking Red Velvet. wow!! Love the look of these cuppies. Nice look velvet cake Jo. I've never heard of this cake either until I came to the US. It is very popular Southern cake and most of the bakeries will have it. 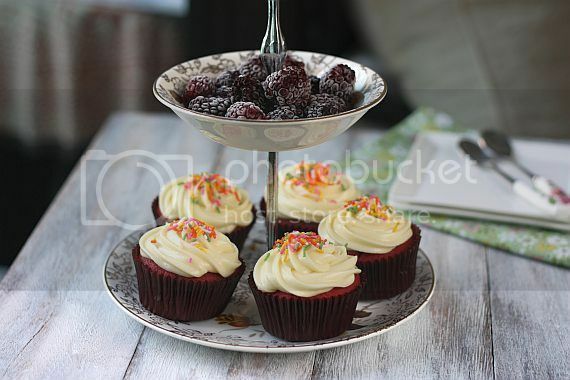 Pretty velvet cupcake...beetroot can't get the colour? If I wan to use it, what should I do, what will be the measurement then? Any advice? They look wonderful. Love the beautifully piped swirls. Awesome- looking cupcakes! Great for a party! i tasted this cake in a buffet dinner before, not that impress actually, maybe they did not add cream cheese frosting. Might try if the right timing come, hehehe..Thanks for sharing the tips. 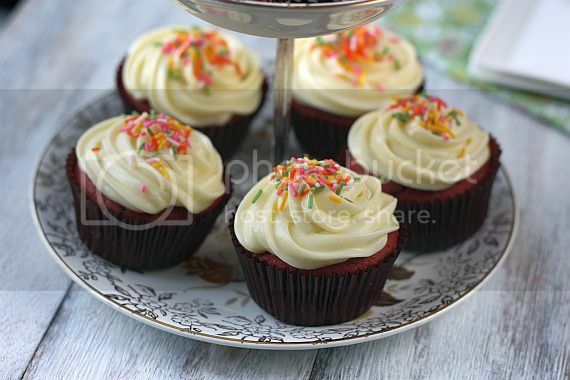 Your red velvet cupcakes looks truly beautiful with its bright red colour! I love it! I've not tried this yet, shall try yours if I want to make them! Thanks for sharing! so stunning!!! This has been on my to-try list for the longest time. You really bake it so well and captured it perfectly. Thanks all for dropping by and leaving me your comments. Always nice to read each and every one of them. Sonia, the cake is actually quite plain but with a cream cheese frosting, it has been totally elevated. This frosting is awesome! I pratically licked it and I'm not one who is into too much topping either. Hi Wiffy, it's actually not a table but rather separate wooden boards which I bought from Daiso. I then painted it white using oil paints. Maybe its the buttermilk. I used milk and 1/2 tsp of lemon juice. But the taste of the cake is great ex. the texture. I think Joy of Baking has the best recipe so far! Recently made their RVC too using the recipe and looks good and taste delish!